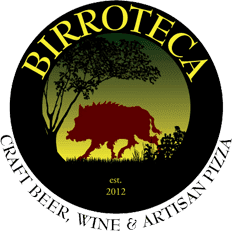 Taking the honor of the last restaurant I will review in Baltimore this year is Birroteca, a modern Italian restaurant with rustic sensibilities. Birroteca has two locations in the central Maryland region, one in Baltimore, and one in Bel Air. Owned by the same owners of Encantada (my review here), I couldn't wait to see how Birroteca would compare. My standards for gluten-free pizza have been elevated to almost unreal level, which has made me cautious to try new pizza places. I no longer am okay with a thin, brittle crust topped with minimal toppings, so I entered the experience halfway expecting to be disappointed. Without spoiling the review too much, I definitely had a tasty culinary adventure at Birroteca that left me wanting more. Birroteca marks their menu (click here) to indicate gluten-free and vegan options, but you'll need to inquire with your waiter to check for other allergens or dietary restrictions. Gluten-free pizza and pasta is available to modify dishes, but there's no vegan cheese to substitute to make items dairy-free. The order is flagged as an allergy order so that the kitchen can make sure to minimize cross contamination. For those who are alcohol-inclined, Birroteca has ciders and mead on tap as alternative to gluten-laden offerings (see those here). The waiter serving my mom and I was super friendly and knowledgeable about how each dish was prepared. 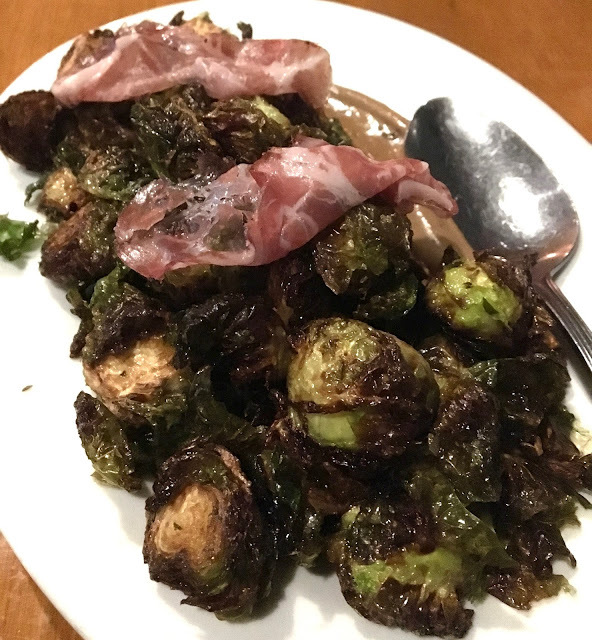 He recommended that we start with Birroteca's signature brussels sprouts, and we couldn't resist the tasty-sounding dish. We decided to split the appetizer while debating what pizza to order. The brussels sprouts are fried to a crispy, crunchy perfection. They proved unquestionably that these vegetables are not to be dismissed as mushy and unappetizing. They were served atop a garlic aioli, which our waiter explained was made with roasted, fragrant, garlic that is handled with care to ensure robust garlicky flavor. Coppa, a thinly sliced pork salami topped the dish, but I did not try it as I am not a red meat fan. 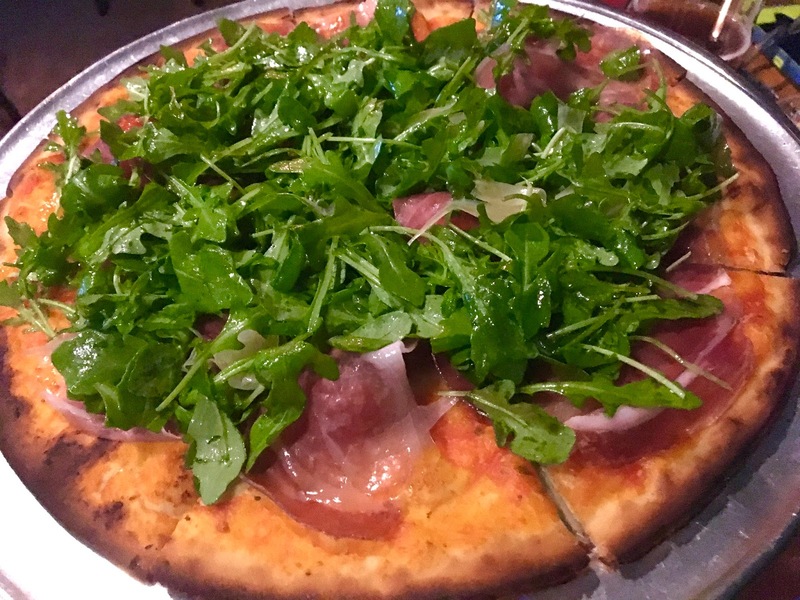 For a pizza, my mom and I decided upon the prosciutto pizza, which comes topped with said meat, cherry tomatoes, and a abundant blend of arugula and fennel. Of course with my dairy-restrictions we had to order the pizza sans cheese, but the flavor of the sauce and toppings more than made up for the missing dairy. The pizza is a good 12 inches- perfect for sharing. The crust is chewy towards the center and crunchy towards the outer crust and was definitely among the better ones I have tasted. It was able to withstand the weight of toppings, and wasn't crumbly, soggy, or cardboard-tasting. The greens atop it were flavorful and fresh and the sauce was robust and tomatoey. Again, I did not try to prosciutto because I am not a huge meat eater, but my mom said it was really good. As pizza eating experiences go, I really liked Birroteca. The atmosphere was hip and authentic, and our waiter really bolstered our experience by being both gluten-knowledgeable but also enthusiastic about the food to guide our ordering and eating experience. The pizza was really, really good but I think the brussels sprouts totally stole the show for me. With two outstanding dishes, I know I'll be back at Birroteca soon to eat around their menu at bit more to see what other culinary creations they serve up. Price: See prices on menu: click here Gluten-free pizza is a $3 uncharge.